Senate Majority Leader Kimberly Yee and Rep. Heather Carter share 2017 legislative session priorities during Capitol Conversations event. As Arizona Senate Majority Leader, Kimberly Yee’s job is to advance the priorities of the entire Senate GOP caucus. And she’s already started that work by crafting her caucus’ priorities for 2017, which she says are business-friendly, pro-growth and posted for the public to see. Yee and other key Arizona lawmakers shared their insight with business and community leaders during the Greater Phoenix Chamber of Commerce Capitol Conversations event Dec. 8 at the Arizona State Capitol. Yee joined lawmakers Sen. Bob Worsley, Rep. T.J. Shope, Rep. Heather Carter, Rep. Reginald Bolding and Joint Legislative Budget Committee (JLBC) Director Richard Stavneak in discussing economic development, infrastructure, education and the state budget with event attendees. Yee focused on how her caucus and all the lawmakers of Arizona’s 53rd Legislature, which begins in January 2017, can effectively manage the state budget, which has a structural balance of $3 million for the first time in a decade. A major aspect of managing the state budget is determining what to do – if anything – with the state’s rainy day fund, which sits at $460 million. Lawmakers receive numerous suggestions from the public, interest groups, advocacy organizations and state agencies on how that money should be spent. As a seasoned lawmaker, Yee is very focused on trying to accommodate the needs of all of her constituents while working with a finite pot of money. Reps. Heather Carter and T.J. Shope discuss economic development in a breakout group session during the GPCC Capitol Conversations event Dec. 8 at the Arizona State Capitol. (Photo by Josh Coddington/GPCC). 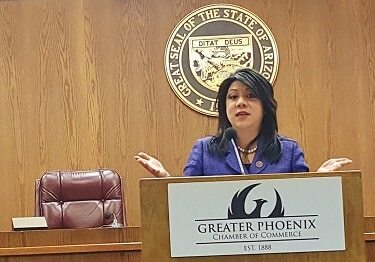 Republican Rep. Heather Carter shared her expertise on the necessity of truly engaging with state lawmakers, creating partnerships and spreading the word about Arizona’s economic development progress. The Chamber advances that progress via Phoenix Forward, the Chamber’s collaborative economic development initiative. During a breakout session on how members of the business community, or anyone, can most effectively have their priorities considered by state lawmakers, both Carter and Rep. T.J. Shope stressed that the key is taking the time and effort to build a relationship. Carter suggested that Greater Phoenix Chamber of Commerce and other business advocacy organizations identify the legislative districts of their business members to facilitate face-to-face meetings and discussions between those business leaders and their specific state lawmakers. “The good thing about Arizona is that we’re the Wild West, we’re nimble, forward thinking and not afraid to try something new,” she said. Carter also stressed the importance of state-level government during a time when most people are focused on the federal government and the actions of President-elect Donald J. Trump. While the incoming president’s decisions surely affect people’s lives, Carter reminded the group that decisions made at the state level tend to have a much more significant impact. Carter closed her remarks by returning to a theme echoed by several of the day’s speakers.